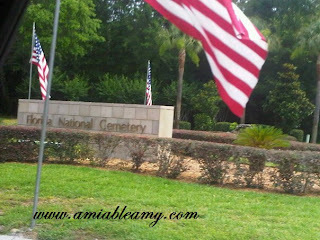 This is Florida National Cemetery located in Bushnell, Florida. We visited our close friend who died a year ago, he was in his 50's. My husband I were never present during his burial so, this is our first visit. 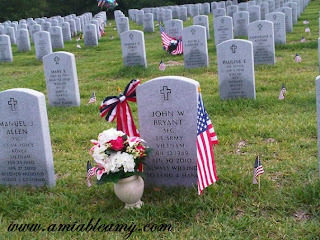 In this cemetery, we have two friends laid to rest and both served in the military for more than 20 years. You can see so many flags every where, the place is huge and it is easy to find his lot even though they all look the same. There is a number at the back of the grave stone and as I observed it, the numbering starts from the right and in inverted S sequence. 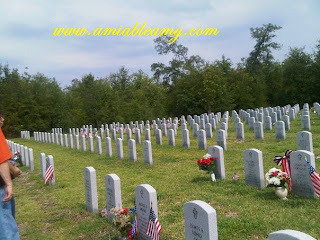 The cemetery Website is cem.va.gov if you want to know more about this place. We arrived almost noontime and it's a bit cloudy making it a comfortable place to stay a bit longer. The place is quite, well-keep, very clean and surrounded with trees and the landscaping is somewhat confusing but, with the help of the green box and the map, we managed to roam around the property. 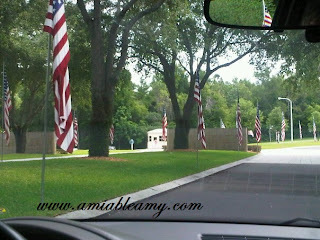 Since it is still Memorial Day Week, flags and flowers are seen everywhere. 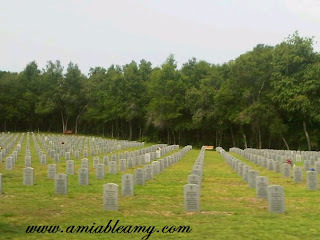 The lot area of this cemetery is 160 acres. One headstone message that caught my attention was: I WILL SEE YOU IN THE MORNING. Very nice and has a deep meaning to it. I wonder who said that phrase? Is it the person who laid to rest or the living person? If you visit this cemetery, try reading the messages on the grave marks, they are so warm and loving messages.